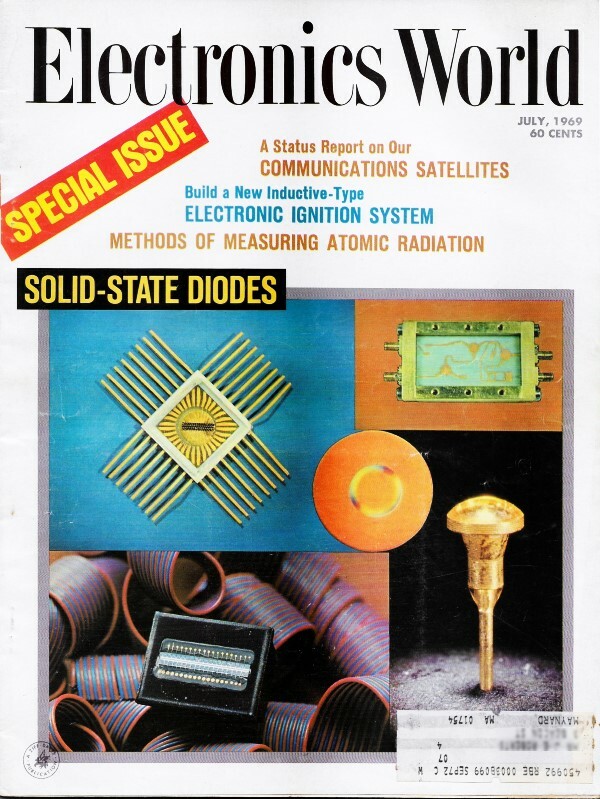 My first exposure to hot-carrier diodes was in the detector sections of the s-band airport surveillance and x-band precision approach radar systems I work on in the USAF. 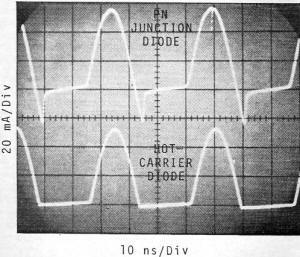 I had no idea what a hot-carrier diode - or for that matter what a Schottky diode, its alternate name - was at the time. Come to think of it, I do not recall them ever being referred to specifically as hot-carrier or Schottky diodes - just "diodes." This Electronics World article from Hewlett Packard engineer Stephen Adam provides some background into hot-carrier diodes, including how their low barrier potential, small junction capacitance, low noise, and short recovery time makes them ideal for high frequency operation. 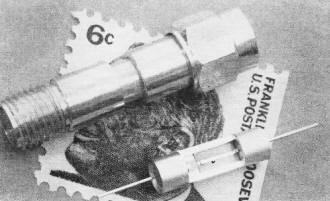 Our radar hot-carrier diodes had the cartridge package style that loaded like a bullet into their holders. The author received his mechanical and electrical engineering training in Budapest, Hungary and holds the equivalent of an M.S.E.E. He holds several patents covering microwave devices and has three more pending. He has published several articles in this field and is the author of a textbook on "Microwave Theory and Measurements" to be published this year. 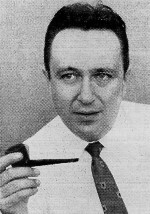 Since 1961 he has been teaching his specialty at Foothill College in California. He is president of the Bay Area Council for Electronics Education, Inc. and is a member of the IEEE. These Schottky-barrier diodes, with their metal-semiconductor junctions, are used as high-frequency mixers and detectors and for very high speed switching. Semiconductors have been used in electronic equipment for decades. Point-contact diodes were the first ones to be used in radio receivers and they are still widely used. in high-frequency applications, for detecting and mixing r.f. signals. The development of p-n junction diodes made possible improvements in many applications at sub-microwave frequencies. Application of the Schottky theory to the metal-semiconductor junction produced the hot-carrier diode, which became one of the most versatile, highly dependable semiconductor devices used in modern electronics. Fig. 1 - Switching characteristics of hot-carrier and "p-n" junction diode with 1-ns recovery time. Signal is 30 MHz. Fig. 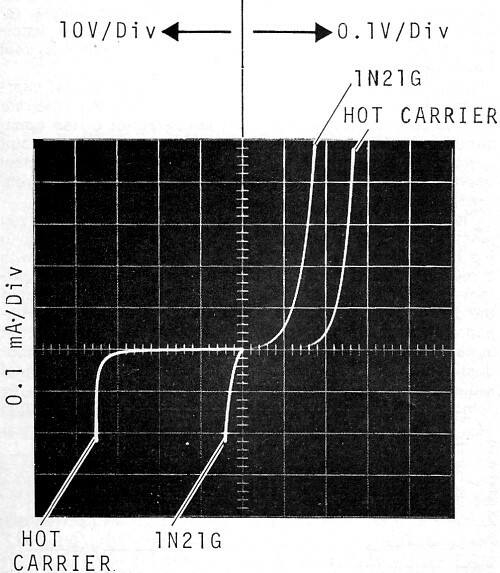 2 - V-I characteristics of hot-carrier diode compared with the 1N21G point-contact microwave diode. The hot-carrier (Schottky-barrier) diode features: non-linear resistance, no stored charge, very short recovery time, ideal V-I characteristics, low barrier potential, low flicker noise, high pulse power capability, good mechanical stability, and high breakdown voltage. These features allow the hot-carrier diode to be used at microwave frequencies and for very fast pulse switching. Picosecond switching is now possible. As microwave detectors, hot-carrier diodes surpass other diodes in sensitivity and square-law characteristics and unprecedented mixing characteristics have been reported. Greatly improved microwave modulators and samplers have also been designed and constructed by using such diodes. Essentially, the hot-carrier diode is a rectifying junction diode, where the junction is formed by a metal and a semiconductor. Either n- or p-type silicon is used for the semiconductor in junction with a variety of metals, such as gold, silver, platinum, or palladium. The operation of the hot-carrier diode, in contrast to the p-n junction diode, is dependent on majority carrier conduction with virtually no storage of minority carriers. Fig. 1 compares the switching characteristics of a hot-carrier diode and a high-speed p-n diode having 1-ns recovery time. 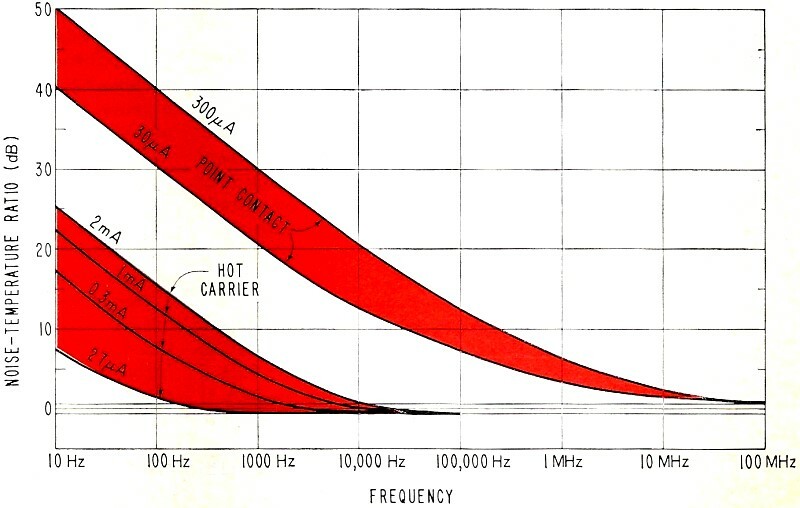 This illustrates the hot-carrier diode's superior rectification efficiency at very high frequencies. Microwave point-contact diodes exhibit similarly efficient rectification since at their point-contact a sharp metal whisker provides the rectifying junction, which is essentially a Schottky barrier. 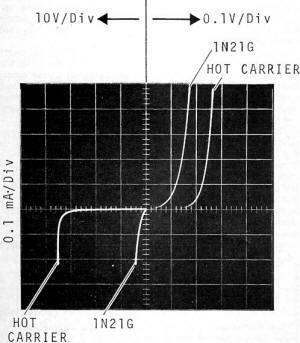 A comparison of the V-I characteristics of a point-contact microwave diode with a hot-carrier diode clearly shows the superiority of the hot-carrier diode (Fig. 2). In the point-contact diode, the metal-semiconductor junction is localized to a very small point, which is like a hemispherical junction. The hot-carrier diode has a true planar junction which provides uniform, repeatable contact potential and current distribution. This structure gives a rugged, lower noise diode, with lower series resistance, which is capable of handling higher power levels and is capable of withstanding larger transient pulses. With forward bias, the electrons in the semiconductor override the barrier potential and with great kinetic energy, or temperature, plunge into the metal, hence the name "hot-carrier diode." As the barrier is reduced, then the amount of current flow in the device increases from the semiconductor to the metal in an exponential manner. Fig. 3 - Various packaging and encapsulating arrangements that are used for presently available hot-carrier diodes. Fig. 4 - The noise characteristics of a typical hot-carrier diode is compared here with a typical point-contact diode at various operating currents. If reverse bias is applied to the hot-carrier diode, only a few tenths of a millivolt is sufficient to reduce current flow to a negligible value. The reverse current leakage is constant until fairly large reverse voltages are applied, at which time, due to breakdown, the current rises very rapidly. Avalanche multiplication causes this phenomenon. A hot-carrier diode is made from a 0.020" X 0.020" heavily doped n+ silicon substrate. An n--type epitaxial layer is grown on one side to a specific resistivity; on the other side a metallic ohmic contact is provided. After thorough cleaning, metal dots are deposited on the epitaxial surface to form a diode barrier. 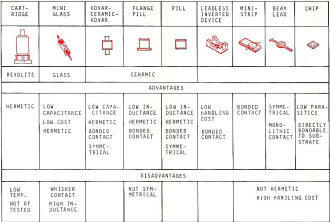 The size of dots and their material is dependent upon the required electrical characteristics. These chips are then mounted into their casings, the type depending upon the application. Sometimes, for very critical applications, the chips themselves are bonded directly into devices to minimize the effects of the casing at very high frequency or with very fast pulses. Lately, a beam-lead configuration has been found to have excellent high-frequency characteristics. Great care has to be taken with these non-hermetically sealed diodes so as not to damage them before they are placed into their mounts and then hermetically sealed. Furthermore, special transmission-line-mounted diodes are available in stripline configurations. 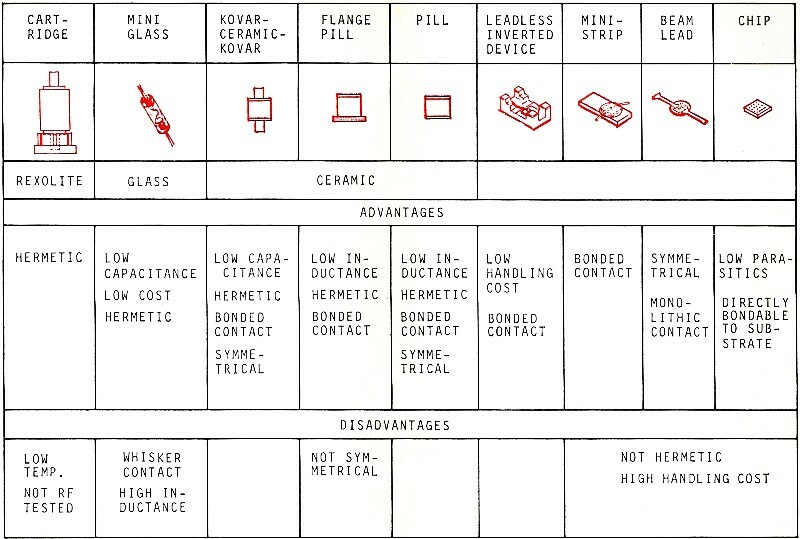 Many types of encapsulation and packaging have been devised to enable the user to mount the diodes in the most desirable fashion. Some of the typical forms are shown in Fig. 3. In addition to single diodes, matched pairs and quads are also available. Quads are marketed in pre-assembled, encapsulated form in bridge and ring configurations, or in matched individual diode form to enable the user to verify the electrical characteristics of the separate diodes. Because of the nearly ideal electrical characteristics of hot-carrier diodes, a great variety of applications is open for them. Extremely fast turn-on and turn-off characteristics in the picosecond region, no charge storage, majority carrier conduction, low noise, and uniform forward and reverse characteristics make them useful even at microwave frequencies. Among the many uses of hot-carrier diodes, probably the most useful is for high-frequency mixer and detector applications. In most cases, a mixer is used for frequency translation to a lower frequency while maintaining the information delivered by the high-frequency carrier. This is accomplished by applying the r.f. input signal with the local oscillator's signal, to a nonlinear resistor (the diode) . Due to the high level of the local oscillator signal, the nonlinear element becomes a time-varying resistance. As a result, the difference of the two signals will appear as an intermediate frequency which is proportional to the input r.f. signal level and independent of the local oscillator signal level. In addition, the sum of the signals will also appear if the mixer's bandwidth is able to carry it. The i.f. can range anywhere up to several hundred MHz, or even a few GHz, depending upon the application. The choice of the i.f. frequency and the mixer diode are basic contributions to the sensitivity of the receiving system. The HP 33801 series hot-carrier diode is shown here in a cutaway view along with its mixer/detector mounting. Typically, noise figures of hot-carrier diodes used as mixers are on the order of 6 to 6.5 with an impedance mismatch of 1.5:1 v.s.w.r. on the r.f. side. Fig. 4 shows the noise characteristics of a hot-carrier diode. The reason for this lower noise behavior of the hot-carrier diode is that it has a planar junction in contrast to the point-contact diode's quasi-hemispherical junction, thereby providing a uniform contact potential. Detectors are essentially low-sensitivity receivers, rectifying the r.f. signal through a nonlinear resistor, a diode. Two kinds of detectors can be considered; small-signal, low-level ones relying on the square-law characteristics of the V-I curve, and the high-level, large-signal, or linear, peak detectors. The small-signal detector operates near the bias point; the output signal voltage is proportional to the input power, that is, the square of the input voltage. One of the most important characteristics of such a detector is sensitivity. Sensitivity depends upon how well both the r.f. input and the video output are matched. Rectification efficiency, noise properties of the diode, and of course the noise figure, input impedance, and bandwidth of the following amplifiers are also important contributing factors in determining over-all sensitivity. Conversion efficiency of hot-carrier diodes is quite small, consequently the sensitivity of these diodes can be vastly improved by biasing them. Bias limitations arc set by the i.f. noise characteristics of the diode and by the amplifier's noise properties. A trade-off has to be reached when no more useful sensitivity can be obtained, due to increasing noise generation. Large-signal detection with diodes is dependent upon the slope of the V-I characteristic in the linear portion of the curve. The diode conducts only over a portion of the input cycle, consequently the output current follows only the peaks of the input signal, with a linear relationship between input and output voltages. Limiter-detectors built with hot-carrier diodes provide such features as: high sensitivity, high burnout energy, low reflection, hybrid integrated-circuit structure, hermetically sealed diode construction, and ultra-miniature size, making them useful for space applications. Schottky's original work on metal-semiconductor junctions opened the door to many experiments. In the early 1960's the "hot hole," "hot electron," "unipolar," and finally the uniformly named "hot-carrier diode," made its debut. Although these diodes have only been in use for the past 5 or 6 years, their desirable characteristics have led to a great many applications. Single diodes with extremely good characteristics can now be purchased for under $2.00. Matched pairs cost less than $4.00 when purchased in small quantities. Matched quads, unconnected, cost around $10.00. The ever-increasing usage and future technological advances promise more price reductions for microwave hot-carrier diodes. One of the most recent developments has been the hybrid hot-carrier diode, where the p-n junction technology is combined with Schottky-barrier techniques. This device offers higher reverse breakdown voltage and even higher speed operation. Future applications in many areas, such as fast switching, sampling, waveform generation, logarithmic conversion in the picosecond region, and modulation, are expected to increase the usefulness of the hot-carrier diode.